Increased foreign demand and rising investments supported by EU funds helped Slovenia to return to a growth path, at least temporarily, after the crisis. 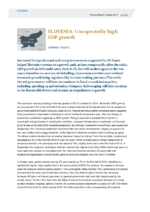 GDP growth in 2014 could come close to 2%, but will weaken again in the two years thereafter on account of dwindling investment activities and subdued economic growth being registered by its main trading partners. The newly elected government will have to continue its fiscal consolidation policy, including speeding up privatisation. Company deleveraging will also continue in the foreseeable future and remain an impediment to growth.